#Outlander Wacky Re-Cap, Ep 405: Domesticity, Danger and the Return of the God-Daddy! Claire’s friendship with Nayawenne the Native American healer is beautiful. Watching them communicate, even without much knowledge of each other’s languages is a poignant reminder of relationships we can experience if only we try and it’s something I’ve witnessed in my own life. I’ve been waiting to see their friendship develop and it was well worth the wait. We’re on Fraser’s Ridge in the Fraser’s cabin and Jamie can’t find his hat and he’s pestering Claire to help him find it. This scene probably rings true for the millions of women watching whose husbands think we’ve got radar attached to our ovaries. I’ve been waiting forever to see the Fraser’s living in happy domesticity and their cabin life does not disappoint. And either Aunt Jocasta has been verra generous with her furnishings or a new Woolam’s Creek Home Goods just opened. Claire’s riding her horse over to Grouchy Gerhard Mueller’s place to deliver a baby and Jamie’s going on a business trip and he’s worried about her riding in the countryside alone. Handsome Roger arrives in Inverness and confirms Brianna went to Craigh Na Dun. At Baird’s B & B, ‘Miss’ Baird, confirms Bree was there and gives Roger a letter from her. Jamie and Ian head to the muddy, booming metropolis of Woolam’s Creek searching for families to settle the Ridge. Jamie goes to see a silversmith about a wee project and his lonely wife is uncomfortably delighted to see Jamie at her door. Name 5 Outlander fans who wouldn’t be. I’ll wait. Claire delivers the Mueller baby. Jamie discovers the men won’t take his offer of 100 acres because Tryon’s tax collectors are unfair and have already seized their land, horses and equipment when they’ve been unable to pay. Mr. Mueller arrives home to find his granddaughter has been born. The indians stop outside his cabin to water their horses and he goes nutz threatening to kill them. Claire defuses the sitch as usual. 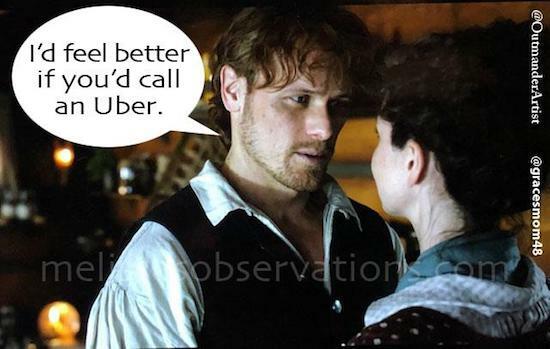 Back on the Ridge, with the men out of town, Claire is doing all their chores, in addition to replenishing her medical supplies and holy smokes, she’s learned how to Click-it! Jamie and Ian are heading back to the Ridge when their horse’s bit breaks. Ian heads over to get the blacksmith to fix it. Ian’s ripped off by the blacksmith so Jamie storms over to give him a piece of his mind. Water begins pouring from the eyes of Outlander fans everywhere as we witness the reunion of the old coot Murtagh Fitzgibbons Fraser and Jamie. The Pastor arrives and Claire discovers the Mueller’s son, daughter and granddaughter have died and Mueller blames Claire. Claire readies her rifle like the badass she is, prepping for Grumpy Gerhart. In the pub, Jamie catches Murtagh up on all the goings on including the fact that Claire is back and their daughter is living the good life in 1971 Boston. Murtagh has the skills to help Jamie with his silversmith crafting project. Jamie invites him to move to the Ridge but Uncle Murty says no. He invites Jamie to a meeting of the Regulators. Turns out Murtagh is the Bossman of the Regulators. Murtagh asks him to join the fight, but Jamie says nope cuz of reasons. In retaliation, the indians burn down the Mueller’s cabin, killing both Mueller and his long-suffering wife in the process. Makes me sad that in real life we’re 250 years later and ignorance has still not been eradicated. Jamie and Ian return home and Claire is safe again. Later, Claire is outside gathering firewood when she hears a voice whistling ‘Boogie Woogie Bugle Boy.’ Murtagh has arrived on the Ridge!! Back in 1971, Brianna has decided to go through the Stones to warn her parents about the fire. I canna wait for the reunion!!! Murtagh’s back and I’m verra happy about it!! Re-cap in the works!! #Outlander, epi 407 re-cap: Yowling Bookreaders,#SophieSkelton Brings It and Roger’s Hot AF Even In His Much Maligned Culottes! My #Outlander, Ep 408 Re-Cap: Everyone’s in #Wilmington, Roger’s Got Chest Hair, #StephenBonnet Must Die and I Love #SophieSkelton. Probably repeating myself, but I live for your observations. Thank you!! You can repeat away cuz it’s always music to my ears!! ‘worst housewarming gift ever’! Try worst gift ever! OMG! Fab recap as usual!